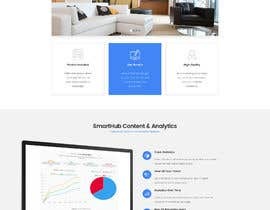 We're looking to redesign our entire company website, as a test we're looking to have someone redesign this one page for us. Please ensure that you submission is not just a template, it must have our information from the below websites on the page in a nice layout. If the winning design is what we're looking for then that person maybe invited to redesign the entire website. We've already attempted to redesign the existing page but we haven't been 100% happy with the look, below is the existing page and the mock design page we've been working on. +We're after a very professional page design. +Please feel free to adjust the header and footer as required. +Wording on your mock design can be from either the current page or the mock page. +Please ensure that ALL areas that are mentioned in the New Mock design page we created are covered in your mock design you submit. +Photos and links can also be taken from our existing sites. We can provide additional images if need be. +Blue (#429EDC) is our company colour and we would like to use that as much as possible on the website as it's part of the company identity. +The gifs aren't the final version, we will create the final version for these so please just leave space for them. Sir, Waiting for your feedback. Hi, thanks for your submission, sadly it doesn't meet the professional approach we're looking for. Hi, I have some pre-designed concepts. If you are interested then please inbox me. Any kind of changes you want will be provided and assures that you will be 100% happy. Hi, If you need the template then I send this to you for $10. Even if you are interested then I have designed 100's of mockup. Please let me know if you need that mockup's. Hi, I'm after a mock up with our actual text in it. do you need only design(PSD file)? No, this is a test. If you're not happy with the prize then don't submit anything. the winner of this will be asked to redesign our entire site. Hi, That's good to hear. Please make sure your submission is custom and meets what I've requested. The above 2 template submissions have no custom work as requested and as a result will not be the winners of this contest.